Real Madrid earned a hard-fought win over Malaga and moved back two points behind Barcelona in the table, keep their title hopes alive. Goals from Sergio Ramos, James Rodriguez and Cristiano Ronaldo saved Los Blancos in a tricky game against the Andalusians, who played a great game but lacked offensive power. It wasn’t an easy victory for Carlo Ancelotti men. 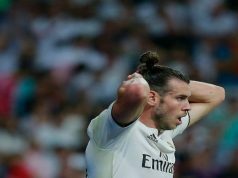 Especially since they suffered a big blow after 15 minutes when Gareth Bale had to leave the pitch due to a hamstring injury. The Welshman was replaced by Chicharito Hernandez and he is expected to miss next week’s crucial game against Atletico Madrid in the Champions League. The Mexico international had a great start, and he was close to giving Los Blancos the lead following a James Rodriguez free kick. However, his brilliant header was tipped over the bar by goalkeeper Carlos Kameni. Yet, Sergio Ramos would make it 1-0 in another free kick after 24 minutes. Ronaldo sent a precise cross into the box and the Spaniard converted from close range. Malaga players insisted the defender was offside. Los Merengues had two goals disallowed before half-time. Ramos found the back of the net again after receiving a cross from Toni Kroos, but his time he was offside. James Rodriguez was also caught offside after sending a shot into the back of the net. 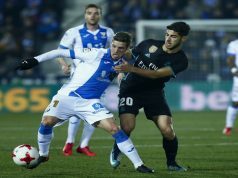 Malaga exerted some pressure in the second half and Nordin Amrabat was close to levelling flusing a powerful shot into the bottom corner, but his effort was just wide of the post. Ronaldo had a major chance to make it 2-0 as Real were awarded a penalty when James was brought down inside the box. The Portuguese’s effort hit the post. However, James scored two minutes later as he fired one into the top corner from outside the box. Juanmi shortened the lead as he headed a Mauro Rosales cross. However, Ronaldo made it 3-1 in stoppage time to seal the win and score his 50th goal of the season. 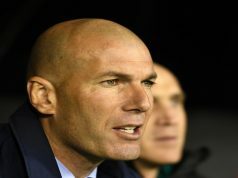 real Madrid should work hard thoroughly to win athletico Madrid in champions league.